The ClientIsNotRegisteredException type exposes the following members. Initializes a new instance of the ClientIsNotRegisteredException class. Use the RegisterClient(OAuthBase) for OAuth clients registration. The following example illustrates a situation in which the ClientIsNotRegisteredException is thrown. 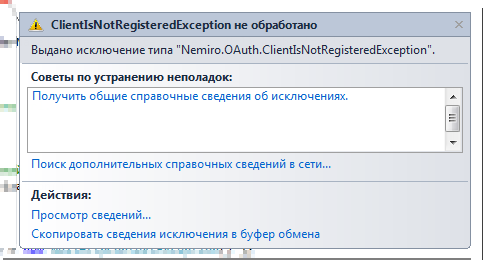 To solve the problem enough to register the client.